Scottscope: Warriors Report To The Game Grid! If I could think up a single term that encapsulates the sinisterly sleek coolness of the Tron Legacy image above it would be "Black Ice". The term refers to ice that freezes with very few air bubbles trapped inside, thus giving it a transparent quality. This phenomenon renders the roads a treacherous obstacle course for motorists. Note the images that term brings to mind: cold, slick, treacherous. That's what the banner above communicates. That amazing image now graces a huge billboard in Hollywood, CA. I like how the filmmakers have evolved the costume designs from the original. The game warriors now use Aerobies instead of frisbees and wear sleek motorcycle helmets. 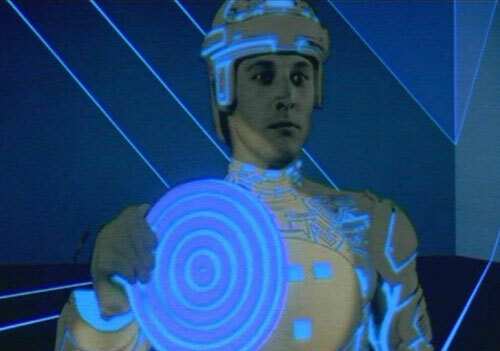 If nothing else, Tron Legacy will look beautiful. Let's hope that we get a good story and a dose of humanity along with the amazing visuals.